Aches and pains, low energy, health conditions — what if all of these issues linked back to certain groups of food in your diet. The Whole30 program builds off this idea, giving your body a way to reset nutritionally over the course of 30 days by taking out those potentially troublesome food groups. Participants in the program look to eliminate cravings, improve digestion and boost metabolism, without the hassle of counting calories or limiting caloric intake. Despite the caloric freedom of the program, over 95 percent of people who follow it lose weight while improving body composition, on top of the health benefits. You can’t argue with weight loss and the potential for improved overall health. Whether you’re in the thick of your 30-day program or you’re just exploring what this challenge is all about, nailing the specific food restrictions without boring your taste buds is not always easy. Filling your recipe box with new and delicious Whole30 recipes inspires you to stick with the program to experience your health-changing body reset. With all the food guidelines of Whole30, trying to create your own recipes can seem intimidating. While we won’t dive into an entire Whole30 guide here, we will highlight a few of the requirements of a Whole30-approved recipe. Knowing the specifics of the program helps you spot a recipe that could fit the program as you’re browsing Pinterest or your mom’s recipe box. Incorporating the approved ingredients into delicious recipes helps you stick to the program. Cooking from scratch with whole food ingredients is the easiest way to avoid any prohibited foods that sometimes hide behind complicated names on the ingredient label. Try these recipes to fulfill the requirements of the Whole30 program. Meat and vegetables are two of the major ingredients on the acceptable foods list for the Whole30 program. 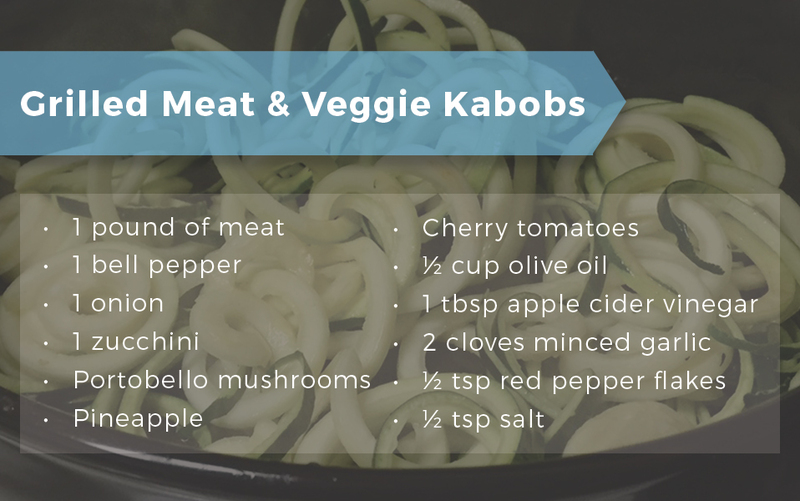 Kabobs are easy to put together and make the perfect warm-weather meal. Toss the prepared kabobs on the grill, and you don’t even have to heat up the kitchen. The great thing about this recipe is the versatility. Choose any type of meat, poultry or seafood that fits the program. Add your favorite vegetables to balance out the meal. Mix up a custom marinade with your favorite seasonings, as long as they don’t contain added sugars or other no-no ingredients. 1. Cut the meat or poultry into 1-inch pieces. 2. Wash, prep and cut the vegetables and fruit into 1-inch pieces. 3. Mix together the olive oil, apple cider vinegar, garlic, pepper flakes and salt to create a marinade. 4. Soak the meat, poultry or seafood in half of the marinade in the refrigerator for 30 minutes. 5. Slide the meat, poultry or seafood onto the skewer, along with the vegetables, alternating the ingredients. 6. Brush the fresh remaining marinade over the skewered kabobs. 7. Place the kabobs on a hot grill, turning frequently to cook the ingredients on all sides. Grill the kabobs until the meat is thoroughly cooked. Who says you need a thick doughy bun to enjoy a burger? Vegetables make a fine stand-in for the traditional burger bun, and they bulk up the nutrients of the meal overall. Choose a thick, hearty vegetable to give it the strength to hold up to your burger. Eggplants work well. Sweet potatoes or Portobello mushrooms give you alternatives for variety. 1. Slice your eggplant or sweet potato to ½-inch thickness. If you are using mushrooms, leave the caps whole. 2. Brush both sides of the vegetable slices with olive oil. 3. Sprinkle the vegetable buns with salt and pepper to taste. 4. Place the vegetables in an oven-safe pan. 5. Roast the vegetables in a preheated 425-degree oven. The veggie buns should be slightly browned and fork tender but not mushy. Eggplant takes roughly 20 minutes. Mushrooms take a little less, and sweet potatoes may take more time to cook thoroughly. 6. Let the vegetable bun cool slightly. 7. Place your cooked hamburger on top of one vegetable slice. Top the burger with your favorite ingredients that comply with the program’s guidelines. Place a second vegetable slice on top. Who needs bread? With cool leaf lettuce and crisp, salty bacon paired with sweet red tomatoes, you won’t even miss the heavy bread component of the classic BLT. Before you reach for any old bacon, note that only a few brands are Whole30-approved. The bacon can’t have added sugar and other unhealthy additives — it’s harder than you think to find — and it needs to come from ethically raised pastured pigs. A few brands that fit the requirements include US Wellness Meats, Naked Bacon and Pederson’s Natural Farms. Local farmers may also offer bacon that works for the program. 1. Wash and dry the lettuces leaves. 2. Arrange one strip of bacon in each lettuce leaf. 3. Top the bacon with tomato pieces. This quick lunch or dinner takes little time to prepare. Keep the ingredients on hand for an easy meal option. Add in avocado or homemade Whole30-compliant mayonnaise for a creamy component. Eggs serve as a major protein source for the Whole30 program, but the staple may start getting boring after several days in a row of egg breakfasts. 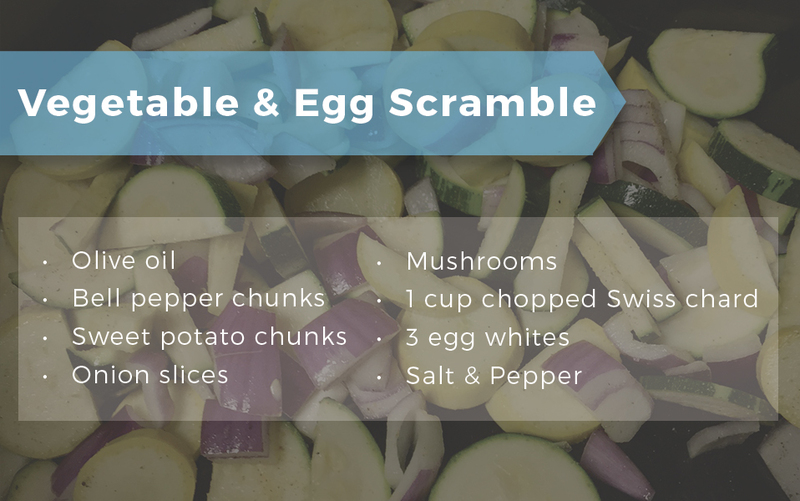 Shake up the egg routine with a vegetable scramble. This is versatile recipe works with almost any vegetable. 1. Heat the olive oil in a heavy-duty skillet on medium heat. 2. Add the selected vegetables to the prepared pan. 3. Stir and cook all vegetables except the Swiss chard for about 10 to 15 minutes until they are tender. 4. Add the Swiss chard. Continue cooking and stirring for about 3 or 4 minutes until the chard wilts. 5. Whisk the egg whites, salt and pepper together. 6. Pour the whisked eggs into the pan with the cooked vegetables. 7. Stir the eggs and vegetables to scramble them together until the eggs are fully cooked. If you want a little more flavor in your vegetable egg scramble, cook and crumble bacon that fits the plan requirements. Incorporate the bacon with the vegetables and egg whites. Are you tired of eating plain meat and veggies? Stir-fry is a flavorful way to combine those two Whole30 staples without getting bored. Stir-fry is a quick, easy dish with versatile options. This recipe pairs shrimp and vegetables, but feel free to mix up the proteins and veggies based on your taste preferences and the ingredients you have on hand. Chicken and steak both work well in stir-fry recipes, and nearly any veggie holds up in the mix. Add a sturdy wok to your kitchen arsenal to cook a top-notch stir-fry. 1. Heat the oil in a wok or skillet. 2. Toss in the shrimp, asparagus, broccoli and pepper. Add the lemon juice, garlic and ground ginger. 3. Cook for 5 to 7 minutes, stirring as the food cooks. 4. Pour in the broth. Simmer the mixture another 2 to 3 minutes to soften the vegetables. The cooking time varies depending on the type of meat and veggies you use. Chicken may need longer to reach a safe internal temperature, for example. Soft veggies cook quickly, while hard vegetables like asparagus and carrots take longer to reach a tender state. Commercial stir-fry sauces are available, but read the labels very carefully. Soy is a common ingredient in these types of sauces, but it is not Whole30-friendly. Added sugars may be on the label. Other additives may also deem a sauce banned from the program. Making your own sauces is always best, so you know exactly what goes into the mix. 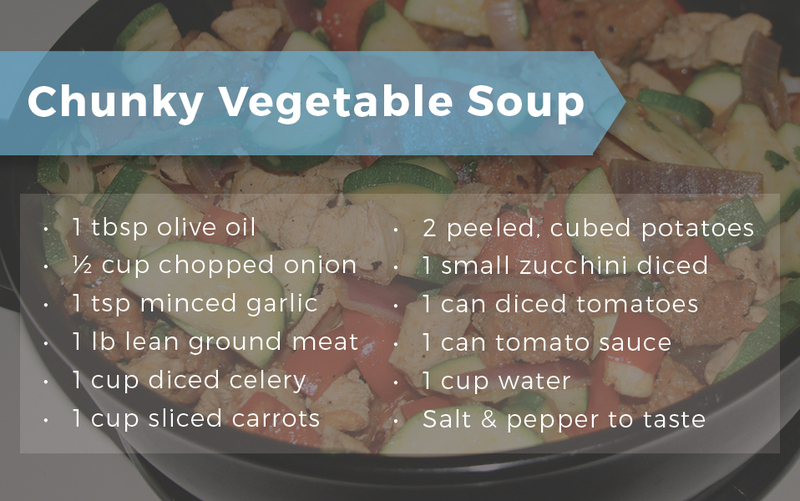 A thick, hearty vegetable soup warms your tummy on a chilly day, but this soup fits into your Whole30 menu any time of year. Use the vegetables you have on hand, leave out the veggies you don’t like or add new vegetables that you prefer. The recipe calls for ground beef, but you can use ground turkey instead, or leave out the meat completely. You’ll want to make a big batch of this soup so you have plenty of leftovers. 1. Heat the oil in a deep pot over medium heat. 2. Put the onions and garlic in the pan. Stir and cook the vegetables for 2 to 3 minutes, stirring as they cook. 3. Add the ground beef, stirring and cooking until browned. 4. Drain the fat from the pan. 5. Add the remaining ingredients. 6. Bring the soup to a simmer over medium heat. 7. Turn the heat down to low. Simmer the soup for about 30 minutes. The vegetables should be tender. Continue simmering if the potatoes and carrots are still crunchy. Experiment with the vegetables you put in the soup. If you like, chunky soup with lots of tomato flavor, try adding some chopped fresh tomatoes near the end of the cooking time. The recipe calls for salt and pepper, but you can add other herbs and seasonings as long as they don’t contain added sugar or other prohibited additives. 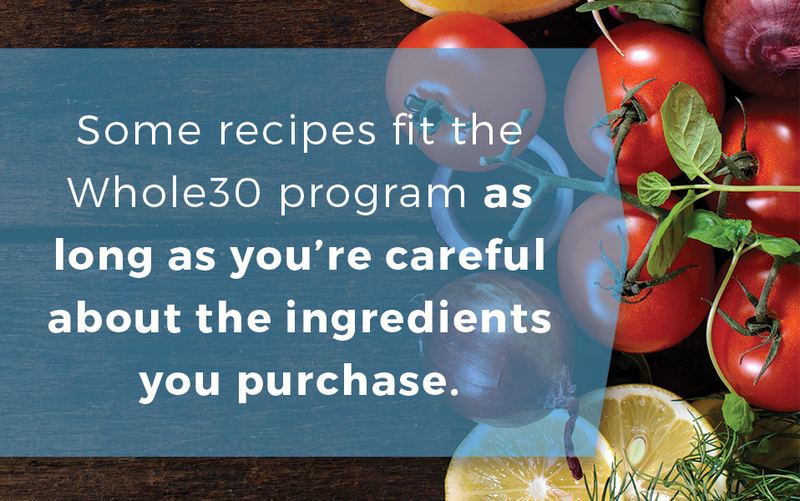 Some recipes fit the Whole30 program as long as you are careful about the ingredients you purchase. For example, canned products sometimes work in a recipe, but they cannot include any added sugars, MSG or other banned additives. Review the Whole30 guidelines multiple times. It sounds simple to avoid certain categories, but there are many little nuances, and items you might think are okay may not actually make the cut. Bring a copy of the guidelines to the store if you’re not sure. Look at the allergy statement on packaged food, this is the bold print near the ingredients list that usually says “Contains:” followed by ingredients such as soy, wheat, peanuts and milk that are known allergens. Since those banned from Whole30, looking for those items in this section of the label can help you eliminate an item quickly without wading through all the ingredients. Learn to spot tricky names for sugar. Any type of sugar or syrup listed on the label automatically disqualifies the item. Natural sweeteners are also fairy easy to spot: honey, molasses, agave nectar, evaporated cane juice. Things get tricky with names such as dextrose, lactose, maltose, monosaccharide, sucrose and many other similar names. Make your own. When it comes to sauces, broths and similar products, learning to make it homemade saves you time in the end. You can still enjoy the flavors, but you know your mayo, ketchup, broth or other favorite sauce complies with the product guidelines. When you decide to take on the Whole30 plan, your cooking routine changes to fit the requirements of the program. Gone are the days of tossing a freezer meal in the microwave or digging into a greasy box of take-out. The Whole 30 recipes get you in the kitchen cooking real food, and all that cooking requires a quality set of cookware. Xtrema ceramic cookware uses an eco-friendly non-scratch design without the worry of harmful chemicals leaching into your food. Try a new Whole30 recipe in your new Xtrema ceramic cookware for a healthy meal and easy clean up.